The Lampster is part superhero-themed sculpture and part retro desk lamp. Created for personal use by Andrew Chivote and Radu Nita, demand from friends and family helped the Lampster project to make its way onto Kickstarter, where it was fully funded in less than 24 hours. The lamp is made out of an old tractor or bike headlight from the 1960s/1970s. Beneath the retro glass is not one but two LED light sources. A clear bulb is activated by touch and shines white while another RGB bulb can change color. Lampster can be controlled with a smartphone app! He’s also ready to party, as the RGB bulb can be set to pulse to ambient music. Lampster’s body is made of recycled polyurethane and stands 18-inches tall -more than adequate for desk use. 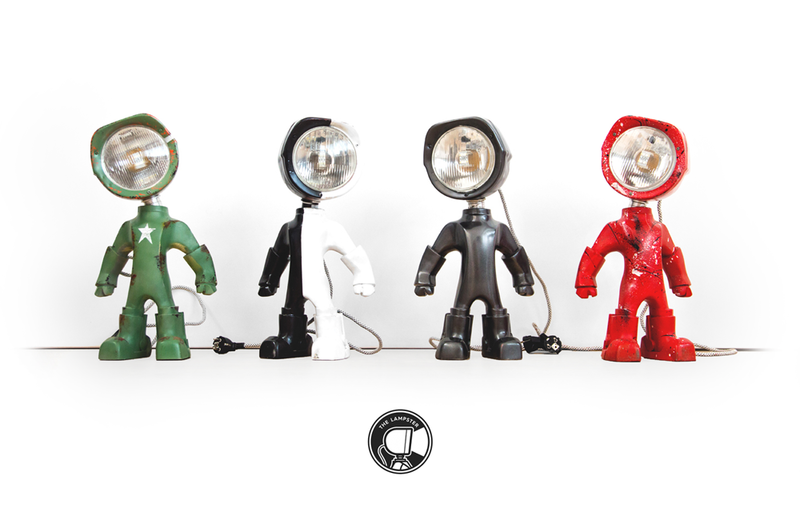 Not only does Lampster sport a distinct “superhero stance”, the body is also functional – it can both balance the headlight and rotate in any direction. Pre-orders for the Lampster start at $178 with an expected delivery date of June 2016. I chose the army theme in silver. Toronto-based Spin Master and Rube Goldberg, Inc. have teamed up for a new line of STEM-based activity sets inspired by the Pulitzer Prize-winning cartoonist.